Cyclone Idai has left Southern Africa in a state of emergency. It is thought to be one of the largest weather-related disasters ever to hit the southern hemisphere. The death toll is currently in the hundreds but we fear this is likely to rise over the next few days. Reports from the ground indicate that hundreds of thousands – and possibly millions – of people could be affected as the flood waters continue to surge across Mozambique, Malawi and Zimbabwe. Reports indicate that 260,000 children are living in desperate conditions. The local authorities are concerned that damage to the water supplies and over-crowding could lead to an outbreak of cholera. 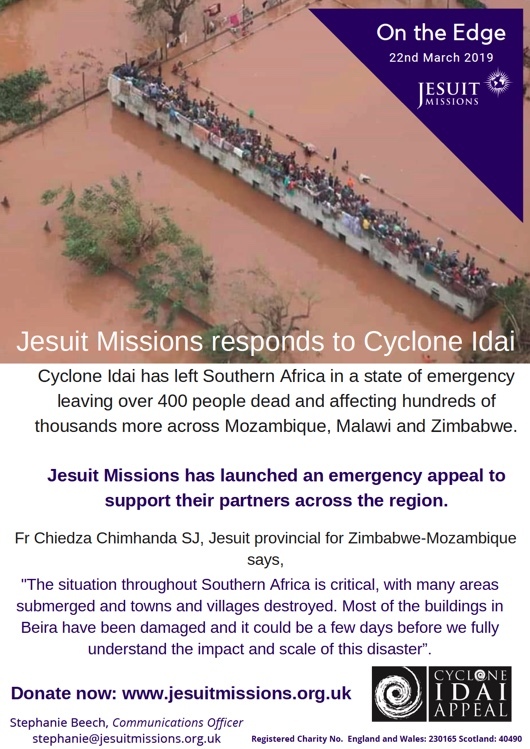 Jesuit Missions is in touch with our partners in Southern Africa as they assess the needs of local communities. The Jesuits have been present in these countries for many decades. They have the confidence of the local people and the experience to accompany them as they recover from this tragedy. With flood waters continuing to rise, the future for thousands of people looks bleak. Southern Africa has already been coping with a chronic food shortage for much of this year and, once again, the poorest people will be most affected. Even if the dire predictions do not materialise, it will take many months for people to rebuild their lives and livelihoods. We ask you to send whatever you can afford to assist with these efforts. Thank you for all you already do for Jesuit Missions throughout the year. Please remember these Crucified People in your prayers especially during this Lenten period.